3MMI - Are Flounder Fillets Still an Affordable Whitefish Option? Are Flounder Fillets Still an Affordable Whitefish Option? Yellowfin Sole harvests were basically on par year-to-year, about 85 percent of the quota was caught. Flathead sole declined slightly year-to-year and Rock Sole decreased about 7 thousand metric tonnes or 15,000 lbs. This fishery has been cause for concern for several years when previously the supply was bountiful for Chinese processors. Raw material pricing is still very strong, ranging anywhere between $2100 and $2300 per metric tonne during the Fall, up considerably from the year prior. Suppliers indicated slower production on fillets right now before Chinese New Year, anticipating new Raw materials by mid-Febraury. It's not certain what new pricing will be but we feel it will be at the same level as now. Twice frozen Fillet pricing has been anything but steady over the past 12 months. Raw materials began to rise in August and then the US Import tariffs on Chinese production in September, this market has risen by nearly $1.00/lb since 2017. 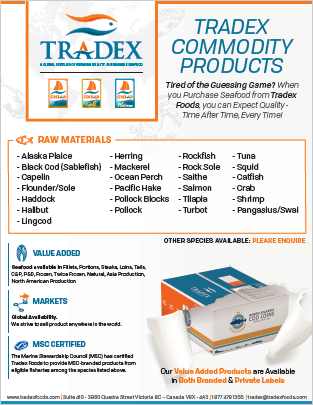 Current twice frozen pricing for skinless boneless premium quality fillets is in the Mid-$3s. What used to be an affordable whitefish option is now double the price of Pollock fillets and approaching Pacific Cod loin pricing. From what we can see demand has lessened overall but it seems the market is accepting this new pricing while we wait to see where raw materials go after Chinese New Year. 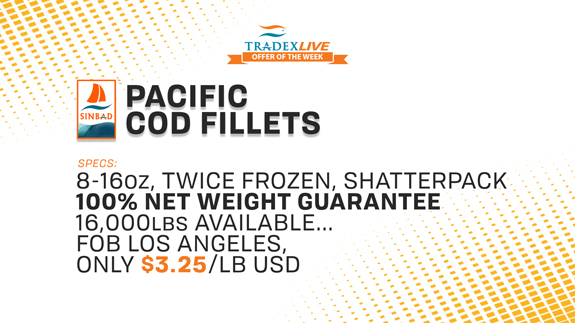 --- In conclusion, our TradexLIVE offer of the week is a great opportunity on twice frozen Pacific Cod fillets. 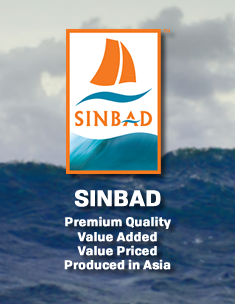 We have 16,000 lbs of 8-16oz shatterpack pacific cod fillets in our 100% net weight guaranteed Sinbad brand. They can be picked up in Los Angeles for $3.25/lb USD.